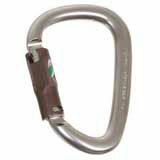 Petzl William Ball Lock Auto Locking Aluminum Carabiner. Large size locking carabiner * Large size and opening to allow anchoring of several ropes and slings * Wide pear shape facilitates belaying with a Munter hitch * Keylock system helps prevent snagging of the carabiner during maneuvers. Requires two actions to prepare to open gate and gate will automatically lock upon release.